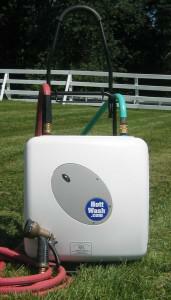 Lets you have hot water for all your needs, ANY TIME, ANYPLACE, even in remote locations. Think about how many times and places you could have used hot water for emergency situations or for everyday usage. Used at Ground Zero for Haz-Mat Decontamination. Adjustable Thermostat 65 to 145 Degrees F.